I just want to give people a glimpse into a side of the medical field few ever see. Most popularized shows or books about doctors place their protagonist in a bustling hospital with constant emergency room action and endless drama surrounding rare diseases or unfathomable accidents. But, what about the doctors who take care of all the folks outside of the big cities? “Tales of a Country Doctor” weaves together a series of short stories mostly acting as a memoir of Carter’s experience as a small-town doctor. From the heart-wrenching tale of little Isobel battling an incurable disease to the humorous anecdote of a pageant gone wrong in “Showgirl,” Carter illustrates the full gamut of the human experience through family, love, loss, redemption, pets and much more. Dr. Paul Carter was born in Warwickshire, England before moving to Australia in 1976. 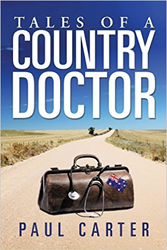 He received his medical degree from London University and founded a practice in Melbourne before deciding to give country living a try. He currently runs a practice in Lancefield, Victoria and continues to grow his role as an important member of the local community.